Thank you to Gerald Reimer for all his help building this beautiful new easel. It’s made out of cherry wood and treated with some crazy new German wax stuff!!! Gerald did a splendid job on this thing and I can’t thank him enough. Also, a shout out to my good friend Mac’s mom whom I met in the store recently and she visits the website every now and then which I thought was super cool! Cheers! Almost done the giant 5 foot Star Wars painting. Here’s a sneak peak at just a small part of this thing! Tribute to Gordon Downie is off to auction! I knew this sketch belonged somewhere but not in my home. It’s going to a new home. Not sure who’s home yet but it will be auctioned off at Cancer Care Manitoba’s annual gold plated event. Here’s hoping it raises some good coin for a good cause. ****update**** I’m happy to announce that the sketch was sold at the Manitoba Cancer Care Gold Plate event for $700.00 !!!! I’m honoured my artwork could raise money for such a great cause. Ok, so this one was for fun. I love grey paper sketches and the challenge of capturing the likeness of someone. This was a colleague/friend I drew. There is a little part of me that loves and hates how subtle lines/shapes/forms can totally change how the person looks. Main thing is, she liked it. That’s going in the win column. Thanks to Tim Bogatz for the great conversation today!!!! It’s always great to be able to share my passion of art and teaching with others. Thanks to the The Art of Ed for having me on! Cheers! So this little painting I cranked out before Christmas as a little honour to my brother in law. Every year we have him down for our “Hipster Christmas” . I try to do something that honours him and his personal journey. This year I decided to paint a tootsie roll. Weird, I know, but back when he was a kid he used to cut them up, repackage them and sell them in his school to make a little extra coin. I’ve always admired his ingenuity and work ethic. I really hope he enjoys this ode to thinking outside the box. Cheers Brendon. Thanks again Tim and the Art of Ed team for the chance to chat. Cheers! Just saw a painting I did a few years back and it was nice to see it again. Had my buddy Addison over today to teach him the benefits of drawing from life. Today we used his grandpa Murray as the model for our drawing. We sat outside, enjoyed the sunlight and fresh air. Time flew by. Happy to have spent it with such great people. Just a little portrait capturing one of many art students I teach. A little drawing, alot of memories. Fun little drawing I did for my bro in law. These are the types of Christmas gifts I really like to give. It was kind of cool making it too. 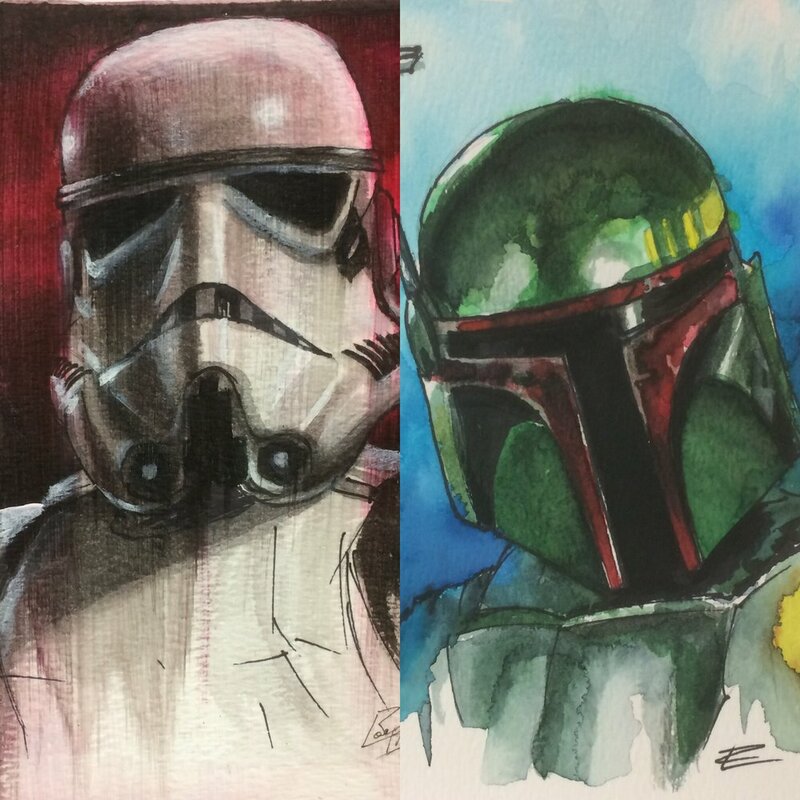 Just having fun making popular Star Wars characters in watercolour. Nice to play with a different medium sometimes. 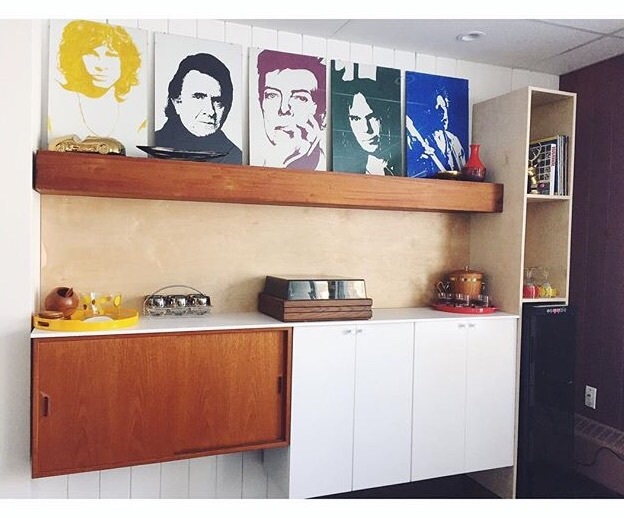 Just a quick post on a painting featured in a photo taken by Cadence Hays aka @thewhiitehouse . Thanks for the awesome picture! Love the work that you do!!! So I finally got to deliver a painting to someone who has played an important part in my life. This painting was meant to be a reminder of his vision of being "merchants of hope." To teach the unteachable, reach the unreachable, and create miracle moments by being merchants of hope for the hopeless. Thank you for believing in me. Photo of "Merchants of Hope" taken by Cadence Hays. 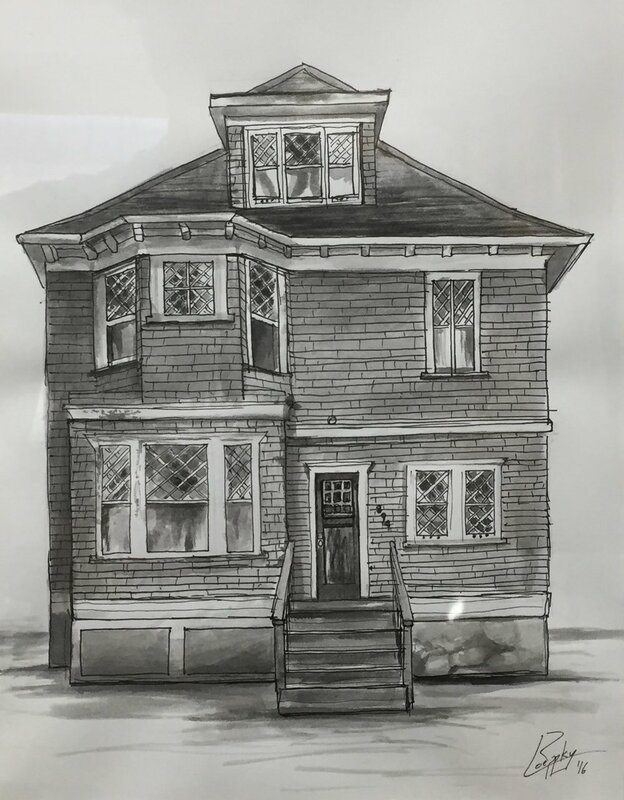 Please check out her work on Instagram @thewhiitehouse . Star Wars painting for my boy has started! I just think it's nice to sometimes make art where I can play and have fun. Here's hoping when the Star Wars themed painting is completed my son will want it in his room! Background started. Death Star is roughed in. Now to put in pivotal characters and machines! Hey everyone, welcome to my new website. I will be posting works and updating you on new projects. I can't wait to start getting images up and running!